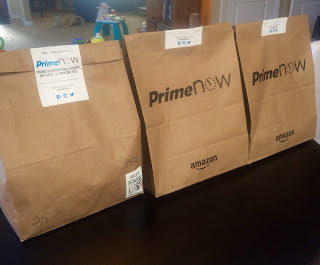 Amazon PrimeNow - San Diego Dining Dish! So have you tried Amazon PrimeNow yet? 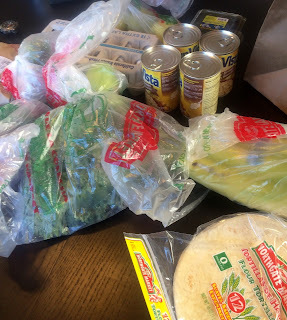 It's a relatively new service from Amazon wherein Prime members can have groceries from select local stores delivered within 2 hours. It is amazingly convenient -- simply log on, choose the store where you want to shop, then pick out the groceries that you'd like. 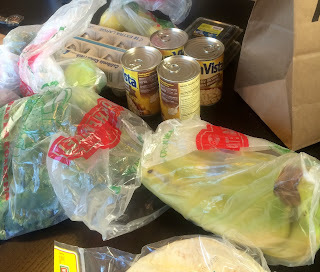 The cost of the food is no different from going to the store yourself, although there is a required tip for the driver ($5 suggested, paid at checkout), and you must purchase at least $20 of items. So how was it? Pretty darn good, I thought. We were able to choose from a nice selection of meats, vegetables, order our staples of canned goods (mainly beans), and even purchased eggs! The customer is able to select the delivery window, so you can choose to have the food delivered right away (within 2 hours if the stores are open), or at your convenience. Could we get everything? Well, no, because there are a few things that we need to go to an actual store to buy (the selection of stores is limited), and I do enjoy picking out my own particular produce. But the convenience of having everything delivered rather than going to the grocery store on a busy Sunday afternoon sure was nice! We were able to have a nice Sunday with my daughter rather than worrying over dinner groceries. I think that this service is a winner, and will be using it again. PrimeNow is currently available in the following cities for Amazon Prime members.